Just received word from Matthieu, our delegate for the Julien and Angelique Thériault Great-Branch from Havre aux Maison, Îles de la Madeleine, that a new Thériault was born a few days ago on 7 May. 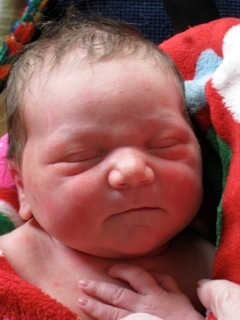 It is a little girl whom they have named Auriane Grace Simon, and Matthieu very thoughtfully sent along a photo. She is just in time for our new update of our Jehan Terriot Archive which will bring the number of Great-Branches very close to 100, if not 100. On reading about MizMo's birthday party on Saturday, Matthieu explained that he would not be able to attend because he's "...Kinda busy right now and a little tired..." While I understand how Matthieu might be busy, I cannot understand why he might be tired." But thanks for the thought Matthieu. I know that you don't usually miss a party. :) Congratulations Matthieu and Manda! I thought I would let everyone know about a very significant event in Erath, Louisiana this week. 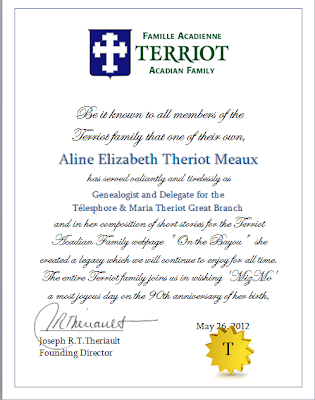 Our dear friend Aline Theriot Meaux who we know as "MizMo" and delegate of our Télesphore and Maria Theriot Great Branch will be celebrating the 90th anniversary of her birth in a few days on Saturday, May 26, 2012! Happy Days! There will be a hot time in town I will tell you. 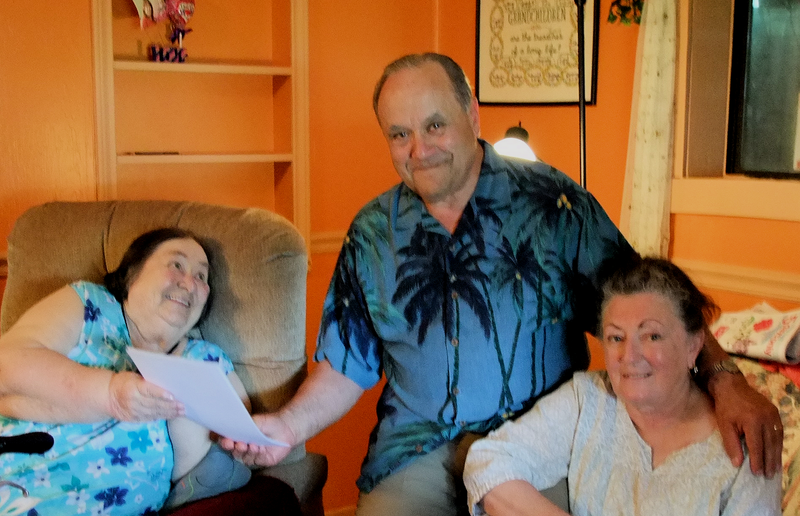 She will be totally surrounded by her family... all of her children, grandchildren and great-grandchildren will be there to celebrate at her daughter, Louise's home in Erath. 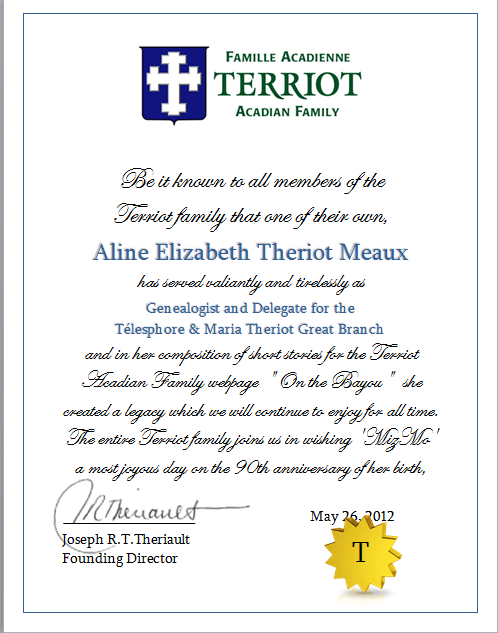 As the author of very significant collection of short histories for "On the Bayou', a section of our family website, she has left us a wonderful legacy that paints a beautiful picture of Acadian life in Louisiana. Please join with me to wish her a most joyous 90th birthday and to thank her for her dedication and generosity. Post your message to her right here. She will certainly receive it and will respond soon. Happy Birthday, MizMo! Bonne Fête, chère Aline!